Of all the television-to-film transitions audiences have begged for, none have been as anticipated or tempted with than ‘Absolutely Fabulous’. Jennifer Saunder’s iconic comedy series always seemed a logical choice to make the jump, mostly because within the restrictions of 90s BBC comedy, it always seemed to be pushing for a bigger canvas. Thankfully, that transition seems to have occurred pretty much as you would expect... as long as you temper your expectations. Edina (Saunders) is starting to go broke, her PR firm losing clients and her extravagant lifestyle finally catching up with her. It all comes crashing down when she accidentally pushes Kate Moss into the Thames during a fashion event. Suddenly on the run with the whole country out for her blood, and with Patsy (Joanna Lumley) at her side and her daughter Saffy (Julia Sawalha) pursuing her, she and Patsy head for the French Riviera determined to finally live the high life they deserve. Everything that makes 'Ab Fab' so unique has carried over to the film pretty much intact, from its bizarre rhythms to its extraordinary collection of characters. The film assumes familiarity with the world of the series, so no time is wasted setting anything up and expanding that world. It never feels a need to explain itself, and it’s all the better for it, allowing it to be as insane as ever. Saunders also takes advantage of the bigger budget and wider canvas, filling the film with even more ridiculous cameos, locations and situations. It feels like an extended episode of the series, but not to the extent that it’s stretched thin. In fact, it’s better than the show itself was in its final years. As a piece of filmmaking, it’s nothing extraordinary at all, with director Mandie Fletcher playing it very safe, but this film was never going to be a groundbreaking cinematic experience. It’s exactly what you expect, and even though I suspect sharper direction might have made it a better film, what we get is still probably better than almost every television-to-film transition in the past. Of course, the real drawcard of this film is seeing Saunders and Lumley on screen together again as Eddy and Patsy, and they’re both still absolute magic. In fact, Saunders has even opened up the emotional canvas of the film, further exploring the relationship Eddy has with Patsy, Saffy and her own mortality. Even more wonderful than the preposterous cameos are the returning cast members, including Jane Horrocks as Bubbles, June Whitfield as Mother, Kathy Burke as Magda, and even Lulu and Emma Bunton jumping in headfirst. ‘Absolutely Fabulous: The Movie’ totally fulfils its brief. It’s preposterous, hysterical, satirical, totally OTT and delectably indulgent. It refuses to take itself seriously, but more importantly, refuses to relinquish its integrity for a wider canvas. This film proves there’s still more life left in these iconic characters, Jennifer Saunders actually finding ways to advance their arcs. Here’s hoping this is the start of a new film franchise, one that continues the misadventures of two of the most fabulous characters ever created for television. It feels like an extended episode of the series, but not to the extent that it’s stretched thin. In fact, it’s better than the show itself was in its final years. The 1080p 2.39:1 transfer is sharp as a tack and as shiny as a glass of champagne. It’s an unashamedly digital look, but what really sticks out are the colours which pop out of the screen beautifully. The transfer is complemented by a terrific DTS-HD MA 5.1 track. Nothing about the sound design of this film is noteworthy, but dialogue is always clear and balanced well with the great music choices. All round, as great a presentation of this film as you could ask for. There’s not much particularly of worth in the special features. There’s a few charming deleted scenes (3:49) and some surprisingly dull Outtakes (8:03). There are a series of promotional featurettes that cover the making of the film, but other than ‘Have A Look, Sweetie Darling!’ (13:50), which offers a pretty great overview of the series itself and its transition to film, the eight other featurettes (all around 2 minutes each) are just repetitive promotional fodder. The strangest extra though is ‘On Set with Dame Edna’ (14:22), a lengthy interview with Dame Edna about the film in which she appears for about 20 seconds. The set is finished off with a photo gallery. The 'Absolutely Fabulous: The Movie' competition has now closed. Winners will be announced shortly. Competition opens at 5pm AEDT on Sunday 27th November 2016 and closes at 11:59pm AEDT on Sunday 4th December 2016. Five winners will be chosen at random on Monday 5th December 2016. To successfully win, entrants must fulfil the above entry conditions before the time the competition closes. Current members/followers are eligible to enter the competition. Only one entry per person. Only one winner per household. To be a valid winner, the entrant must not have won a prize from SWITCH within the last 28 days. 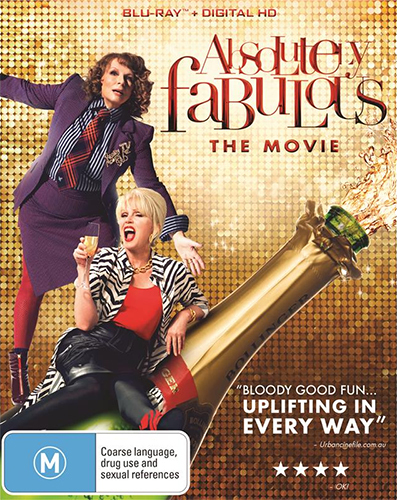 Each winner will receive one Blu-ray copy of 'Absolutely Fabulous: The Movie'. By entering, you agree to receive occasional emails from SWITCH in the future. If you decide to unsubscribe from these updates, any further entries will not be applicable. Only Australian residents are eligible to enter. 'Absolutely Fabulous: The Movie', this season’s must have is on Digital HD from November 23 and Blu-ray & DVD from November 30.